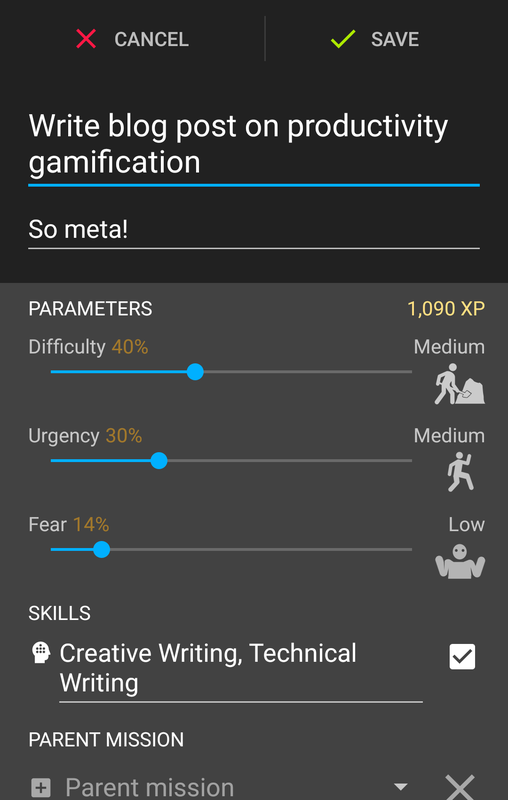 LifeRPG is available for free on the Play Store (unfortunately there is no iOS, web, or desktop version available). When you open it for the first time, the app presents you with a blank template—there are no pre-defined goals, rewards, or profile data. The app does come with a built-in manual, however, which you can access from the side menu. Lets look at the various elements in LifeRPG in more detail. Missions are the key focus of LifeRPG. A mission can be any task you want to accomplish, whether it’s an everyday habit or a goal that you’re working towards. You can manage long-term or multi-part goals by breaking up missions into several child missions that need to be completed before the parent mission can be completed. Each mission has three parameters that determine the overall importance of the mission: difficulty, urgency, and fear. Difficulty is how challenging you feel the mission is. Urgency is how quickly the mission should be completed. Fear is how concerned, anxious, or nervous you are when thinking about completing the mission. Each of these parameters is measured on a scale from 0—100, where 0 is none and 100 is extreme. Note that these parameters are completely subjective and are based entirely on your perception rather than actual real-world values. Adjusting these parameters changes the amount of experience you get from completing the mission, which I’ll explain in a later section. Beyond these parameters, you can also set a due date and time, reminders, the parent mission (if this is a sub-mission), and the repetition frequency if this is a repeating mission. You can also set the duration (how long you expect the mission to take), the geographical location where the mission takes place, and a reward for completing the mission (also explained in a later section). As a fun little bonus, you can also choose an icon from a built-in pack to uniquely identify the mission. Skills measure your proficiency when doing various types of tasks. A skill can be anything from doing yard work to playing basketball to tying your sneakers. You can assign one or more skills to missions, and as you complete those missions you “level up” in those skills. You can use this to track how often you’re using certain skills and whether you might need to focus more on neglected skills. Again, these are completely subjective and vary based on your lifestyle and the habits or goals you want to track. You can also categorize skills under more generalized categories for easier tracking. When you complete a mission, you can award yourself a certain number of reward points (RPs). RPs are a sort of virtual currency which you can use to “buy” yourself treats. Anything you consider a reward—desserts, a night out, renting a movie, etc.—you can assign a RP value. When you consume those rewards in real life, you purchase the reward in LifeRPG using RPs you earn from completing missions. This is the feature that I personally found the most useful. Not only does it help me track how much and how often I indulge, but also whether I’ve truly earned them based on how many tasks I do throughout the day. Did I really do enough to earn that bowl of ice cream, or am I just telling myself I did? Another benefit of the reward system is that it tells you when you last purchased a reward. So depending on how long it’s been since that last doughnut, you may want to skip the next one. 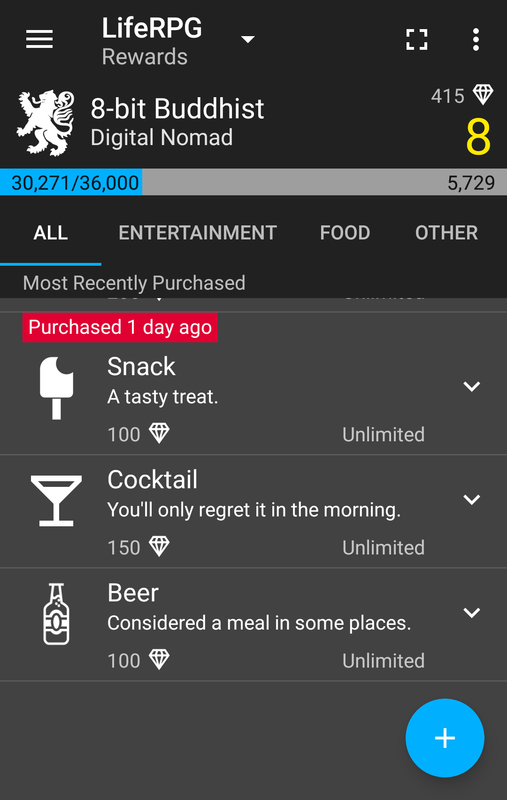 LifeRPG also offers a system for tracking items that you own, or that you accumulate from rewards. I personally haven’t found a use for this outside of simply recognizing items I own that are important to me. If anything, it’s a good way to reflect on what you own, what’s important to you, and what you can do without. Your first mission (should you choose to accept it) should be a relatively simple task to help you become more familiar with the app. Let’s start with a basic task that most of us do everyday: brushing your teeth. It’s easy to do, but just as easy to forget to do, so we want to give ourselves a bit of positive reinforcement whenever we brush our teeth. What skills will I practice while completing this task? How difficult is this task? Do I need to complete this task by a certain date? How much should I reward myself for completing this task? Let’s start by looking at skills. Brushing your teeth doesn’t take much effort, but it does improve your overall hygiene. We’ll create a new skill called hygiene and categorize it under Health & Wellness. Each time we brush our teeth, our hygiene skill increases slightly. This lets us track how much effort we’re putting towards our hygiene skill and how it changes over time. Tip: You can add a description to anything in LifeRPG. I highly recommend doing this since it makes the game feel more personal. Next, we’ll create the actual mission. Give your new mission a title and a fun little description. When you come to the Parameters section, consider the implications of brushing your teeth. How much effort does it require on your part? How important is it to your overall health? These answers will determine your difficulty, urgency, and fear values. If you have a history of cavities or oral surgery, these values may be significantly higher than someone who just wants to keep their mouth clean. Whatever your motivations, set each parameter to a value that reflects your feelings about the mission, and remember that you can always change these at a later time. In the next section, select the Hygiene skill we created in the previous step. Click the check box next to the text area to select the skill from the list. Note that you can select multiple skills for a single mission. Below the skills box is the Parent Mission box. This lets you turn the current mission into a child (or sub) task of another mission. For example, if you were really adamant about tracking your hygiene, you could have a Clean Teeth parent mission with Brushing and Flossing as separate child missions. 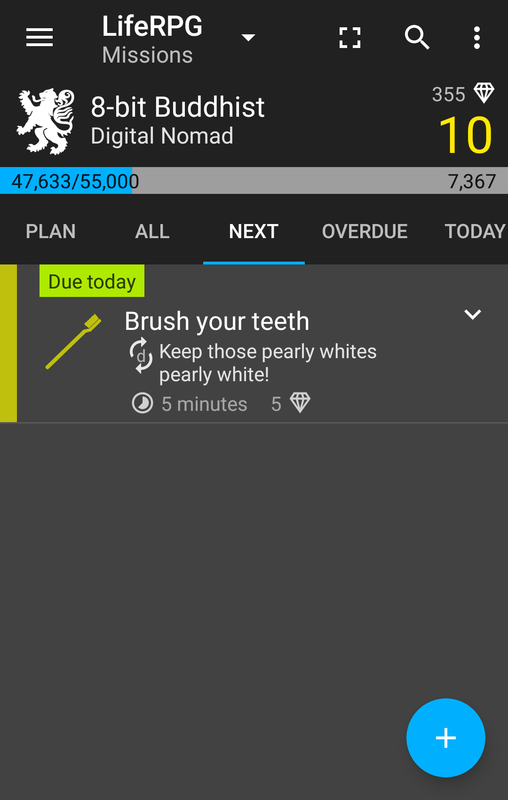 The next few sections let you set the due date, reminders, repetition, and duration of the mission. These are pretty self-explanatory. Due dates, repetitions, and the mission duration are shown in the mission list once you leave the mission edit screen. 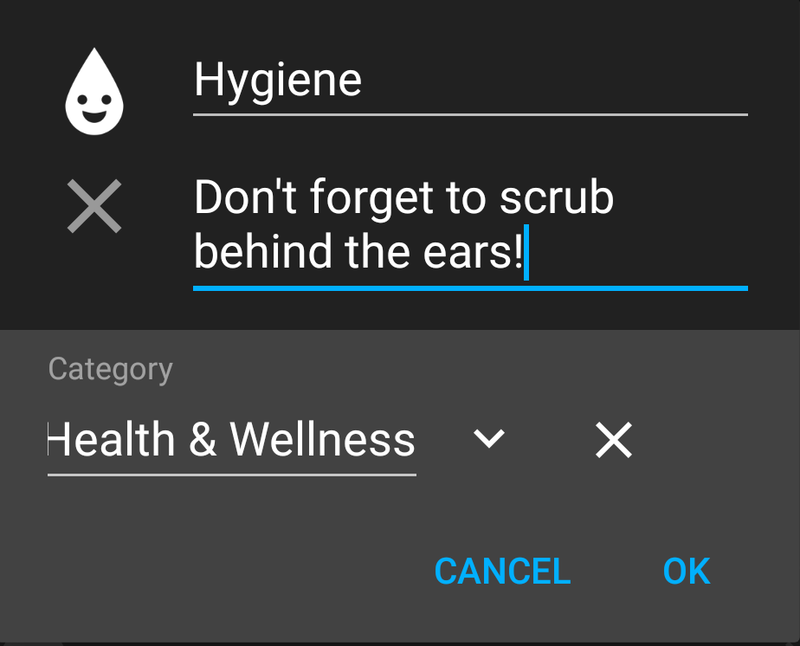 Reminders display notifications on your phone when their time has been reached. I have this mission repeat daily with a 5 minute duration. Unfortunately, I haven’t found a way to make missions repeat twice daily without creating separate missions for the morning and for the evening. The Location box lets you specify where the mission is taking place. For an additional fee, you can purchase a map which shows you an overview of where your missions take place. However, this is completely optional. The Reward box is where you determine how many reward points (RPs) you will receive each time you complete the mission. Since this is a frequent recurring mission, I set this to something small (5 RP). Many of my missions range from 10—20 RP, and some lengthy or multi-part missions may range from 25—50 RP. Finally, you can assign an icon to the mission. Icons are a quick and fun indicator of what the mission is all about, but they are entirely optional. And that’s it! The next time you brush your teeth, tap the mission then tap the empty check box that appears underneath the description. This marks the mission as complete, changes the due date to the next day, and assigns you experience and RPs. Speaking of which, now is a good time to set your rewards. A reward isn’t something you earn immediately after completing a mission. Instead, it’s something that you save up for by completing several missions. A reward should be a treat, something that you put effort into earning. The hardest part of using LifeRPG’s reward system is finding the right values: set them too high and they won’t feel worth the effort, but set them too low and they’ll feel cheap. For example, beer is something I consider a reward. Each can of beer is 100 RPs, and each time I brush my teeth I get 5 RPs. If brushing my teeth is all I ever do, I can earn a beer after 10 days of consistent balance. You’ll need to tweak this balance to your specific needs, and it may take some practice before you find a good balance between the cost of your rewards and the amount of RPs you earn from missions. You can specify additional options for each reward such as the total quantity of a reward and whether buying the reward adds it to your inventory. Quantity helps you track how much of the reward is left and can help add a sense of value and satisfaction to buying rewards, since you know it’s a limited quantity. I don’t use the inventory system myself, so I tend to ignore this setting. One very useful setting, however, is in the Options tab. Here, you can choose to have LifeRPG automatically increase the cost of the reward each time you purchase it. This is great if you want to cut back on the amount you are consuming a certain reward. For example, if you need extra motivation to quit smoking, set your cigarette reward to increase by 10 RPs with each smoke. This encourages you to either finish more missions and be more productive, or cut back on the amount you smoke each day. Again, this is all driven entirely by your own motivation and discipline. LifeRPG simply provides a platform for managing it. If you’re like me, at some point you’ll be curious to see how far you’ve come. 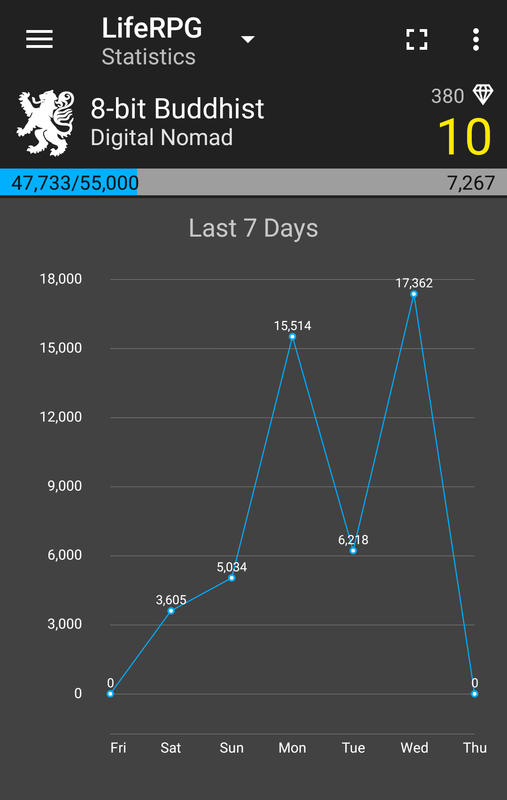 Perhaps the best way is through the Statistics screen, which shows you how much experience you’ve earned on a daily basis over the past week. Tapping on a specific day opens a list of missions completed on that day as well as the RPs earned from each mission. You can also list all of your completed missions in the Missions screen by tapping the menu button and tapping Show completed. This also shows you when the mission was completed relative to the current date. 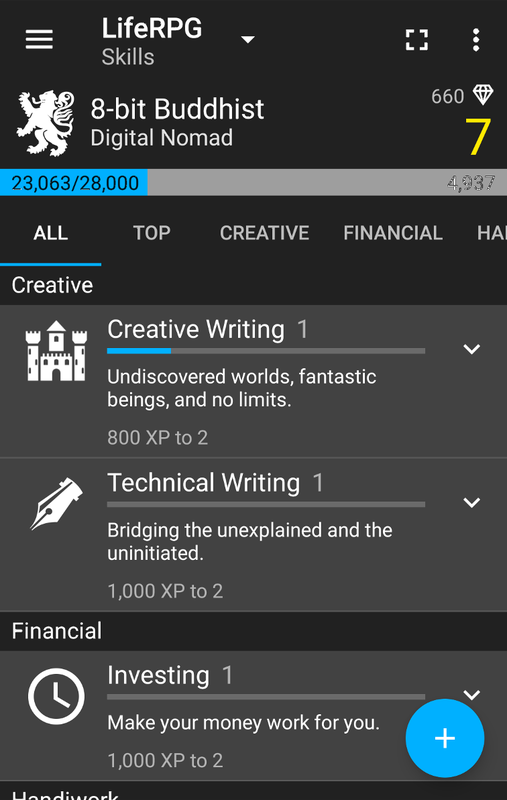 LifeRPG is one of the most useful productivity apps I’ve ever used. While it’s harder to get started with than most apps, you can quickly find yourself in a flow of tracking tasks as missions, checking off rewards, and setting skills without even realizing it. It’s an incredibly useful app with a huge amount of potential, and I genuinely encourage anyone looking to motivate themselves to give it a try. This has been helpful but I just had a thought what if users of this app earn titles through completing certain missions when their skill Rises to a certain degree to a certain level they can earn a new title. Great idea! I looked into it and there’s another app called Do It Now that supports this. I’m pretty sure Do It Now is just a continuation of LifeRPG, so you might want to look into it instead. Why do you think is that? Same developer? Or is it a clone? It’s a different developer. I probably confused the two because Do It Now was originally called LifeRPG Tasks. But while LifeRPG hasn’t been updated since June 2017, Do It Now appears to get frequent updates.